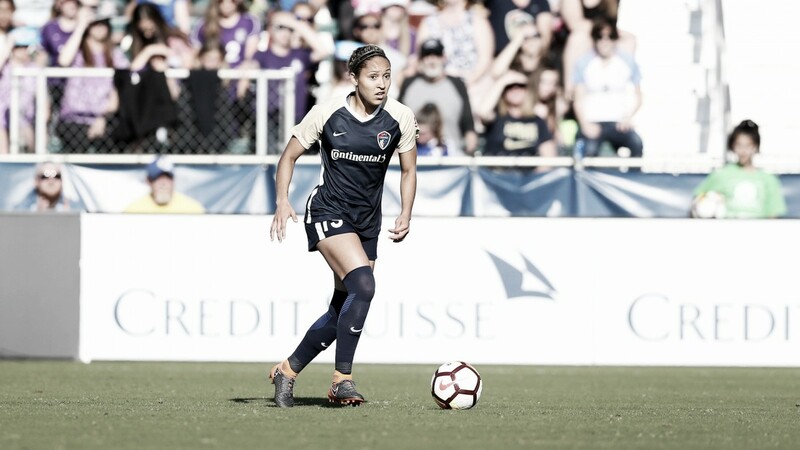 Jaelene Hinkle officially confirmed in an interview what everyone already knew- she withdrew from the USWNT friendlies in 2017 because of the pride jerseys. The NWSL, MLS, and the football world in general has been publicly supportive of the LGBTQIA+ community. Teams celebrate pride month with special pride matches, the stadium in Orlando has 49 rainbow seats dedicated to the 49 lives lost in the Pulse nightclub shooting in 2016, and the US famously wore pride numbers on their jersey’s in June 2017. That’s where this comes from. And then went on instagram and posted a longer message. It was officially revealed in an interview with the 700 Club released on Wednesday that she withdrew from the trip because of her faith. 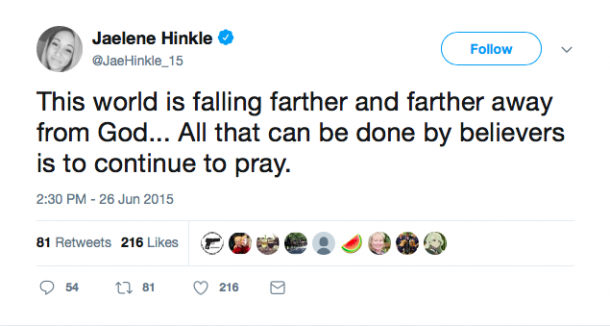 Hinkle said that she prayed on it for a few days before giving her response. Hinkle has not been called in to the national team since. Marriage equality should not be a polarizing topic. Especially with the separation of church and state, any religion should not be the guiding principles for legislation. That’s what separation of church and state means. If the founding fathers had wanted Christianity to be the guiding force for the government, they would’ve made this country a theocracy, not a democracy. Hinkle is allowed to have her own opinions. That’s one of the best parts of a democracy- civil discourse. At least, that’s supposed to be one of the best things. She is allowed to believe what she wants, but it’s hard for me as a dedicated Christian to sit back and accept it. Without getting too preachy, Jesus Christ, in the Christian faith, is the epitome of love. “Love God and love your neighbor as yourself”- the greatest commandments. “Faith, hope, love- the greatest of these is love.” The very basis of Christianity is based on the ideals that love is the most important thing. Someone who doesn’t agree with love or doesn’t enact love is misguided in their faith. The US was making a statement that love wins. Those numbers and the proceeds from the jerseys went to support a community that is constantly discriminated against because of who they love. Being against THAT is being against love. Hinkle can have her opinion. She can refuse to wear the equality shirts during pride matches, she can throw away her national team career to try and be a martyr, but people can be upset. The response last night from the Portland Thorns crowd to Hinkle was understandable. The Portland crowd is hostile with rivals alone, but when one of those rivaling players vocally objects to a large portion of soccer supporters, they aren’t going to be happy. And they showed it. There were several new posters in the supporter’s section- including one that read the words “Personal Reasons.” Hinkle was booed on several occasions, including during the starting line-up and during several corner kicks. Hinkle shared her opinion, and the crowd shared theirs. Nothing wrong with that. So, yes. Jaelene Hinkle can believe what she wants. But now that she is public and vocal about those feelings, she is going to have to deal with the backlash. If crowds want to boo her during the starting line-up? They can. If they want to hate the team she’s on because of her? They can. She has to deal with the backlash. These soccer fans are passionate about what they believe in- and they let you know it. She knows that. Love wins. Love will always win. So, while she believes that this country is falling further from God, I believe the opposite. I believe that that decision brought us closer to God. Anytime people choose love over hate- that’s what brings them closer.